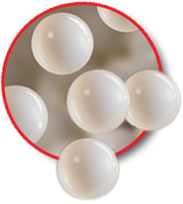 Zirconium beads go by many names around the world: Mahlperlen in Germany. Bolas de Moliendas in South America. Pearls in Europe. Zirconia beads in Asia. But whichever corner of the globe you call home, whatever you call the beads, one thing is clear—FOX Zirconium Silicate Grinding Media is the right ceramic grinding media for you. Let me explain. FOX Zirconium beads are sintered. Most ceramic media is sintered now—it’s true. But don’t be fooled. Not all sintered grinding beads are created equal. And making the wrong decision can cost you more than just a few dollars. You see, these grinding balls are in a class by themselves, because the brilliant minds of our talented research and development team have done what no one else has. They’ve come up with a high-tech grinding process that makes this milling media solid, from surface to center. This technique, results in a stronger molecular structure, which increases density and wear resistance. It’s the reason no other ceramic ball has yet come close to FOX Zirconium Silicate Grinding Media. Why take chances with any other grind media for your bead milling? Make the Better Choice. Choose FOX grinding media balls.